Love is in the air! People will do amazing and wonderful (and slightly psychotic) things for love. In my case, I ran to the kitchen after a loved one discovered an extreme physical reaction to wheat. This is what happened. A lot of people ask me how I got into making and selling grain free products. It was a bit of a journey, but I am happy to share it with you here. About six years ago my husband got very sick. Not just a stomach bug that lasted a few weeks, but months of an odd combination of symptoms and strangeness. I watched him go from a vibrant, creative husband and father to a weak, frail person barely able to get out of bed for more than ten minutes. A plethora of tests and examinations resulted in diagnoses ranging from alcoholism (for someone who had not had a drop for six months, and never had that particular issue) to multiple sclerosis. No amount of medication or treatments seemed to reduce the symptoms. Until we tried an elimination diet. Long story short, eliminating then reintroducing a wide variety of foods and beverages was very revealing. We did this without medical assistance, for all the medical professionals wanted to ‘fix’ him with prescription drugs and therapy. Granted, such solutions work effectively for many, but in my husband’s case, it seemed rather aggressive and complex without trying simpler steps. It might also have helped if there had been any agreement on a diagnosis. Toning down his beverages revealed that aspartame-laden diet sodas were having a significant impact on his nervous system. After going through a withdrawal period, just having one diet soda with aspartame brought back some symptoms. Such sodas were thrown out immediately. It sounds strange…but he could finally walk again without a cane. And even run. Another revelation was two-fold. He had gastrointestinal problems for years. To counter the discomfort he had regularly taken some acid reflux medicine. After a very painful and uncomfortable withdrawal period, allowing his body to again produce a healthy amount of stomach acids, he was able to eat food without symptoms. The second element of this process was discovering that every time he consumed wheat the stomach discomfort returned. Out the window went wheat. His belly has been much, much happier for years now. The next step was to ease the frustration of avoiding wheat by substituting gluten free solutions. Bottom line – the products found in stores usually tasted like cardboard and were nutritionally lacking (but so was the wheat). As we sat in our kitchen one day, pondering the issue and missing many of the comfort foods we grew up with, we decided to figure out satisfying, nutritional substitutes. Gluten free grains were just not cutting it, so pursuing other avenues was the next step. Our journey to starting Grain Free Haven was quite challenging. I hope that at this stage in the journey, sharing what we have learned helps ease the burden of others who have similar challenges with wheat or other grains. Check out our past Newsletters to learn more about the ingredients we use and why, and please ask questions when you have them. I certainly want to help! This recipe was one that brought my husband full circle in the comfort food department. 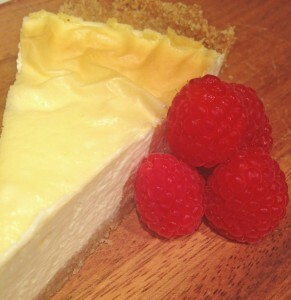 His love of cheesecake and key lime pie were appeased (by sometimes adding extra lime) with the crust and creamy custard. Make it for your love this weekend without guilt! Preheat oven to 325 degrees. In 9″ pie dish cut a round of parchment paper that fits the bottom of the dish. Crust: in medium bowl stir together all dry crust ingredients. Add the butter and stir until the ingredients clump. Add the egg white mix until well combined. Crust will still be crumbly. Press crust into dish until bottom and sides are covered. Filling: in large bowl combine cream cheese and sour cream. Whisk together until completely smooth. Add butter and stir again until smooth. Add eggs and yolk, stir to incorporate and until smooth. Add stevia, lime zest, lime juice and vanilla. Beat until well combined and smooth. Pour filling into crust and gently smooth surface. Place in oven. Bake for 30-35 minutes, until filling sets. Turn off heat without opening oven door. Leave cake in oven until oven and cake are cooled, about one hour. Remove from oven and chill for at least an hour. Serve plain or with fresh berries. Saturday, February 13, 2016, 8am-5pm: Dallas Farmers Market. The professional football season is over, Advent has begun and the days are getting longer. What can you do but think about how to spend all that extra daylight time? Don’t worry about baking grain free staples! Come by and get some Power Bread and muffins for your week and don’t worry about sweating over a hot oven! Let us do it for you! Sunday, February 14, 2016, 10am-5pm: Dallas Farmers Market. Ah, love! For many today is a day of expressing it in simple or extravagant ways. Come by and get some sweet treats, like Chocolate “Cinn” Cashews, Peanut Butter Chocolate Chip Cookies or sugar free, dairy free Coconut Macaroons! Regardless of how you spend the day, come out for some fresh air, a quiet stroll and check out all the hand made goods at the market! If you come by my booth and tell me this week’s discount code you will get $1 off any purchase of $15 or more! The code for this week is LOVE!